Most people know that Friedrich Engels (1820–1895) was the lifelong friend and collaborator of Karl Marx, and for most people the image of Engels that springs most readily to mind is of a heavily bearded, earnest old Victorian gentleman (most likely standing in the background of a group consisting of Marx and his family). In this excellent and inspiring biography, John Green sets out to “remove much of the historical dust, in order to reveal the man of flesh and blood hidden beneath, someone we can readily identify with and who comes alive through his passionate historical intervention”. Like Che, Engels had a practical as well as theoretical interest in military matters (so much so that he was nicknamed ``The General” by the Marx family). Indeed, the young Engels bears a remarkable physical resemblance to Che, and the front cover of Green’s biography carries a photograph of Engels in his early twenties that bears a striking resemblance to Alberto Korda’s famous photograph of Che. Usually, historical biographies are written in the past tense, but Green has chosen to write this biography in the present tense in order to “communicate the immediacy of his life and the revolutionary events that accompanied it in a more intimate way than the distancing past tense could have done”. Green does this very successfully, and the picture that emerges is indeed of a “principled and passionate man whose every action was taken on behalf of his fellow human beings”. The man of flesh and blood emerges too: we hear how after the failure of the 1848 European revolutions the 28 year-old Engels walks the 500 kilometre from Paris to Switzerland, how he reacts to being called a “bloody foreigner” by a man in a Manchester pub by hitting him over the head with an umbrella, of his relationship with the near-illiterate Irish factory girl Mary Burns and – following Mary’s death – with her sister Lizzie. In addition to providing a compelling portrait of Engels the man, Green also sets the record straight on the contribution Engels made to the birth and development of modern socialism. It is common nowadays to hear Engels characterised as a crude simplifier, or perhaps even a falsifier, of Marx’s views. Green counters this by reminding us that not only did Engels take on the gargantuan task of turning the mass of near illegible notes left by Marx after his death into the second and third volumes of Capital, he was also responsible for pointing Marx in the direction of political economy in the first place. Green explains the pivotal importance in the development of Marx’s own thinking of Engels’ 1844 essay “Outlines of a Critique of National Economy” and his 1845 book The Condition of the Working Class in England: the latter is described by Karl Kautsky as “the beginning of theoretical socialism” and “even in the area where Marx achieves his greatest fulfilment – political economy – it is Engels who, certainly to begin with, is very much the feeder. It is undoubtedly he also who pushes Marx in the direction of investigating the role of private property and the contradiction between the humane phraseology of capitalism’s apologists and the inhumane practice of the free market system. It is Engels who explains to him how economic crises occur and the minutiae of capital accumulation and concentration.” Indeed, Marx himself says to Engels in a letter from the mid-1860s that “I am always following in your footsteps”. In addition to the intellectual contribution Engels made to the development of Marx’s thought, Green reminds us that for 20 years Engels held down a desk job that he hated in order to finance not only Marx and his family, but a number of other socialists and socialist organisations. Unfortunately, in what is an otherwise admirable book, there are a few inaccurate details and occasional lapses: it is to be hoped that these might be corrected in some future edition. For example, on page 59, it is claimed that Engels read and admired the work of the novelist George Eliot in the early 1840s. Green must have the dates wrong here: Eliot’s first work of fiction wasn’t published until 1857. On page 117, Green has Marx and Engels elaborating historical and dialectical materialism in the mid-1840s: again, in the case of the latter variant of materialism this is surely at best premature. On page 168 the notion of “permanent revolution”, as characterised by Engels in 1850 and developed by Trotsky in the 20th century, is implausibly run together with Mao’s “Cultural Revolution”. On pages 208-9, Engels’ characterisation of an independent proletarian party in his 1865 brochure The Prussian Military Question and the German Workers’ Party is described as “the blueprint for all the world’s communist parties that will be established in future decades”. If, as is usual, “communist” refers specifically to the parties of the Third International, this description seems highly unlikely and surely also underplays the relevance of Lenin’s thinking on party organisation. On the other hand, if “communist” here doesn’t refer to the parties of the Third International, then Green’s claim is simply misleading. Indeed, on page 321 Green seems to contradict these earlier statements when he notes how Engels’ thoughts on party organisation depart from those later adopted by the Third International. On page 211, in outlining some of Engels’ original thinking on military matters, Green writes: “Although many of his ideas have since been overtaken by developments, he certainly provided some ground rules for Lenin, Trotsky, Mao, the young Che Guevara and other guerrilla leaders when seeking inspiration in his military writings”. But it is surely misleading to speak of Lenin as a “guerrilla leader” (and the same may also go for Trotsky). Finally, on the last page of the book, Green applies to Engels I.F. Stone’s assessment of the forces driving Che as “deep humanity marred by an element of ruthlessness”. Putting on one side the question of whether or not this is accurately said of Che, it is surprising to hear Green say it of Engels, since nothing in the book suggests that Engels was in any way marred by “ruthlessness”. However, these worries aside, this is an excellent book, clearly written and an enjoyable read. 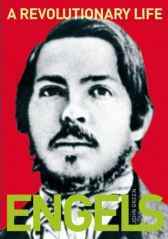 Green brings Engels and his work vividly to life, and in doing so he has done the labour movement an enormous service. This book deserves a wide readership and a place on any socialist’s bookshelves.